Doug Wimbish, bassist of Living Colour, joins Roosevelt Collier’s Trio for a night of sacred steel and massive low-end. You won’t want to miss this unique show. We are thrilled to announce the Doctor’s return to the Lion’s Den! Soft-spoken by nature, south Florida-bred Roosevelt Collier does his hollering on the sacred steel guitar. Brought up in the tradition of the House of God Church, Roosevelt built his reputation alongside his uncles and cousins in The Lee Boys, known for their spirited, soul-shaking live performances. Seated front and center, “The Dr.” leaves an indelible mark on listeners, flooring audiences with his lightning-fast slide work on the pedal steel. At festivals, he is a regular “Artist at Large,” performing alongside many of music’s most prestigious acts, from the Allman Brothers, to the Funky Meters, to Los Lobos to the Del McCoury Band. 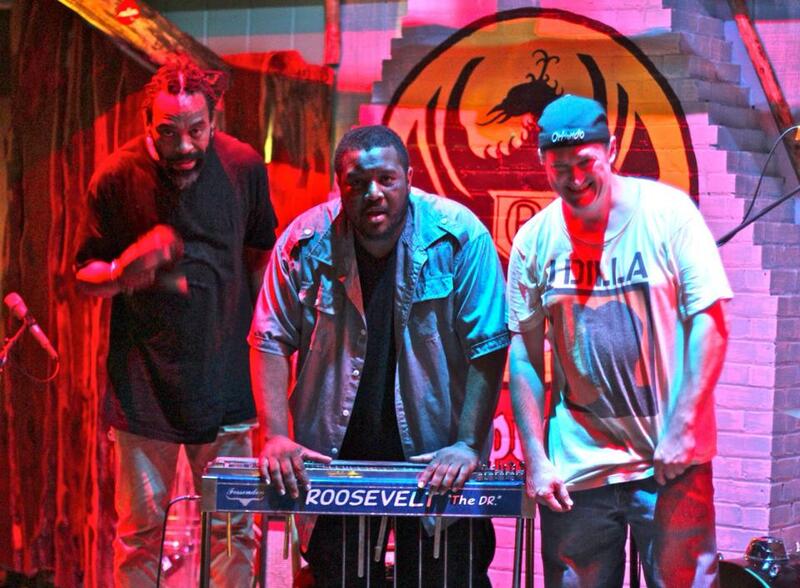 Whether on tour with the Lee Boys, bouncing from stage to stage at festivals, or hosting an allstar get down in Miami, when Roosevelt takes the stage, the ear-to-ear grins can’t help but be contagious. Pedal steel guitarist Roosevelt “The Dr.” Collier has announced an Official Warren Haynes After-Party on Thursday, October 22nd at the The Gleason Room Backstage at The Fillmore Miami. This special late-night performance will have a “Jimi Meets Funk” theme, with Collier being joined by Anthony Cole (Doyle Bramhall II) on drums and Matt Lapham (Shak-Nasti) on bass for some funky takes on the music of Jimi Hendrix. The show takes place right down the hall from where Haynes will be headlining. Matt’s all over the state..
Two nights of funky goodness! Matt and Oteil bass it up!! Roosevelt Collier & Friends: South Florida GetDown featuring Roosevelt Collier, Oteil Burbridge, Kofi Burbridge, Anthony Cole, Matt Lapham, Jason Matthews & Johnny Walker – Live @ The Funky Biscuit, Boca Raton, FL., 4-10-2015. Recorded by adam @ CHeeSeHeaDPRoDuCTioNS. Roosevelt Collier & Friends: South Florida GetDown featuring Roosevelt Collier, Oteil Burbridge, Kofi Burbridge, Anthony Cole, Matt Lapham & Derrick Lee – Live @ The Funky Biscuit, Boca Raton, FL., 4-11-2015. Recorded by adam @ CHeeSeHeaDPRoDuCTioNS. It’s the Dr’s birthday and we’re celebrating it here in Otown! Fine tuning for the Purple Hatters Ball! Time to levitate!